For their second show in their new space (which has hosted several other theater companies in the past six months), Gremlin Theatre is presenting the intense two-hander A Steady Rain. Buckle up, friends, this is a tough one. But so beautifully done. In what's basically a treatise on toxic masculinity and the damage it can do, playwright Keith Huff has created two complex characters in a brilliantly written play that's impeccably executed by the team at Gremlin. Two incredible acting performances, tight and clear direction, simple yet powerful design that heightens the storytelling, all in an intimate space that makes it feel all too real. This is the kind of show that's tough to shake. The rest of the day, and even into the next, I found myself back in that room inside that brutal story. It may only be mid-January, but no doubt A Steady Rain will be one of the most memorable plays of the year. 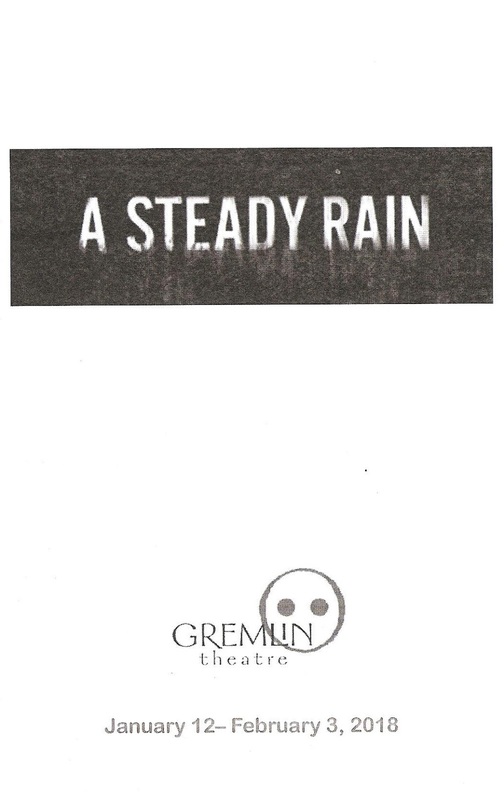 Gremlin refers to this play as a "duologue," an apt description. It's constructed as parallel monologues by two characters, lifelong friends and partners in the Chicago PD. 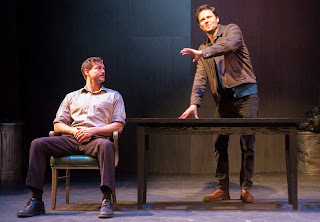 It almost feels like an interrogation, the stage bare except for a table and two chairs, with Denny and Joey talking directly to the audience for much of the play. At times the two monologues intersect for a scene between the two men, but most of the time it's just one or the other telling a story. And a play that mostly involves people talking about the action rather than showing the action shouldn't be so riveting, but it's written with such biting and dynamic dialogue that it absolutely is. We can't see any of the things that are happening, or any of the other people in the story besides Denny and Joey, but it's like they're right there in front of us. The play centers around one particular incident in the lives of these cops, when someone shoots a bullet through Denny's front window, injuring his young son, and the lengths Denny goes to to make them pay. He becomes obsessed to the point of ignoring everything else, and the partners' already shaky standing in the department is further threatened because of it. I won't tell you all that unfolds, but it's absolutely brutal. It becomes clear that Denny is a very damaged man, a man who won't accept help from anyone and insists on taking care of things himself, until even his best friend Joey and the family that he loves can't save him from himself. Director Ellen Fenster usually makes me cry; in this case I didn't actually cry but felt all of the emotions. She gets terrific performances from both of her actors. Gremlin Artistic Director Peter Christian Hansen does the more subtle work as good cop Joey, while Dustin Bronson explodes as the troubled Denny (gosh is it good to see him back on #TCTheater stages after a 2+ year absence, if only temporarily). Both actors are so in it, with nowhere to hide in that small space, the emotions playing clearing across their faces. And they have a beautiful brotherly chemistry between them. But it's Dustin who really broke my heart in this one. Despite Denny's many bad choices, he's not an unsympathetic character, and that's largely due to Dustin's portrayal that makes you believe that he truly believes what he's doing is right and for the good of his family. This play elicits a visceral reaction. Thanks to the spot on lighting and sound design (by Carl Schoenborn and Katherine Horowitz, respectively), I flinched at surprising bolts of thunder/lighting, at particularly intense moments my breath became short and my heart rate increased as I covered my mouth with my hand, and at times I closed my eyes at the violent imagery, even though there was nothing on stage to see. The intimate thrust stage at the Gremlin means that the audience is only a few feet from the actors, using every square inch of the space, which makes it feel like you're inside the story, almost uncomfortably so. 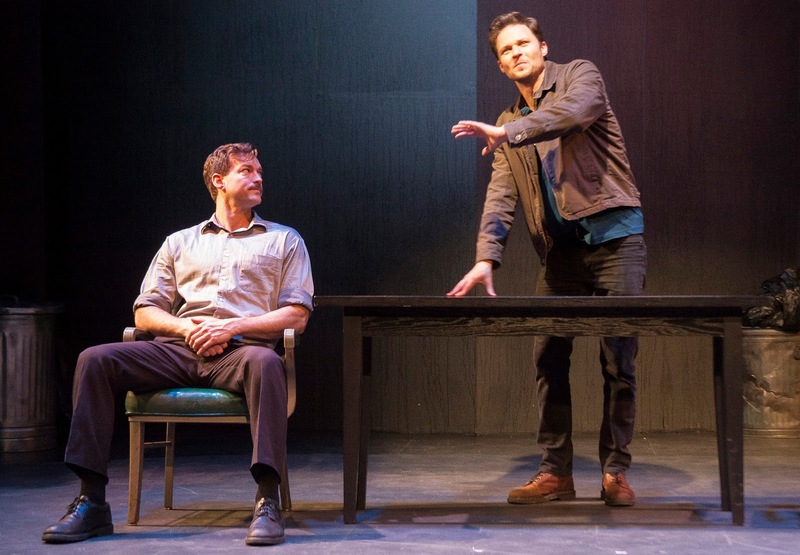 A Steady Rain is not an easy play to watch, but it's incredibly powerful, and there's some great work being done on that stage. Continuing through February 3 at Gremlin Theatre off University in St. Paul (discount tickets available on Goldstar). Trigger warning: there is a gun on stage, and per Chekhov it does go off. The play also includes harsh language and depictions of violence.